Come see this adorable bungalow patio home that is ready for new owners! Situated in the quaint neighborhood of Orchid Springs, this home sits on the first street that has only a few homes. This home sits on the very end of the road with only one side neighbor and conservation wooded area to the right of the home as well as across the street for added privacy. With no pass through traffic, this is a very quiet lot. With 2 bedrooms, 2 baths and a split floorplan, this is the perfect home for first time buyers or downsizers while still providing tons of living space. 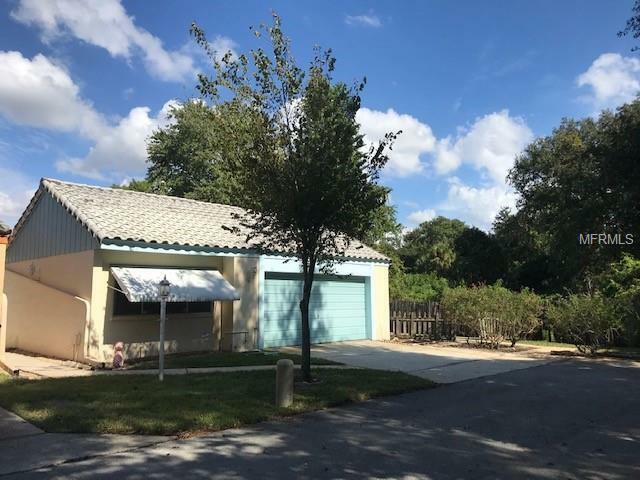 This home offers a large living room space with additional nook in the same room for either formal living or breakfast nook, as well as an additional office/den space with patio access and an enclosed Florida room for added dining/living space off of the kitchen. The Master bedroom sits at the rear of the home with tons of closet space and access to the completely private wrap-around courtyard. The en suite bath boasts a walk in shower and single vanity. This patio home is truly that... with lots of outdoor living spaces included, it's a perfect little getaway to enjoy the Florida sunshine. If a dip in the pool is more your speed, take a very short walk to the community clubhouse and pool to enjoy a swim. This community also offers lots of events for your entertainment including card games, bingo, breakfasts and more. Come see this home today before it's gone!